At dusk on a warm November evening in 2005, I was crawling into my tent for a bite of dark rich warming chocolate and spotted the erratic flight path of what looked like a swallow above the giant kahikatea trees encircling the Pelorus campground. The ‘bird’s’ crazy darting flight had me perplexed for a while, until it dawned on me that I had clapped eyes on New Zealand’s only land mammal: a bat! A bat-encounter is a rare thing in New Zealand– they are not only enigmatic and nocturnal, they’re becoming increasingly rare. 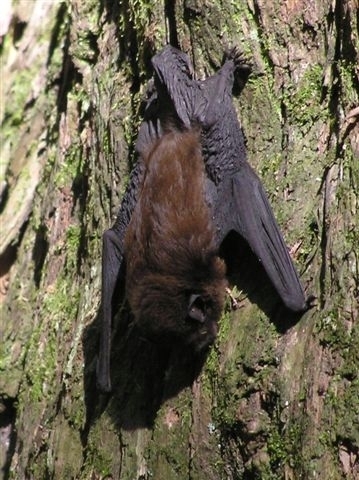 Once widespread, our two species of bats are now eking out their existence in dwindling scraps of forests throughout New Zealand – favouring river valleys and remaining red beech forests. Surprisingly, we don’t know enough about bats and the extent of their populations, and their secretive nature doesn’t assist us in helping to save them. Regional surveys in the top of the South Island show that once more widely spread, their presence is dwindling to pocket enclaves. This decline has been marked since the 1960s – although without comprehensive research and knowledge, we cannot readily assign a cause. It may be a combination of factors. Last year, the Department of Conservation upgraded our South Island long-tailed bat threat status to nationally critical. The next stop is extinction. The population at Pelorus River Scenic Reserve is one of the long-tailed bat strongholds in the top of the South Island and it population is estimated to sit at just 20 -30 bats. In an effort to protect these creatures we’ve initiated a Bat Protection Project with the help of volunteers, DOC, Ngati Kuia, and our on-the-ground bat expert, Dr Brian Lloyd. The project is taking a two-pronged approach to bolster this bat population: pest control combined with population & food-source research. Aside from predation, Brian believes the long-tailed and short-tailed bat’s demise may be due to competition from introduced German and Common wasps. In late summer these wasps form large swarms in our beech forest lapping up every last drop of nectar and decimating the insect population – in effect leaving little food for our bats. He believes the reason for the remaining population at Pelorus Bridge and campground is because they live in ancient podocarp forest with nearby streetlights supplying a regular source of food. A future we want to avoid is telling our grandchildren the sad tale of the last of the long-tailed bats in the South Island. And although we are rightly proud of the work we are doing at Pelorus Bridge, pocket enclaves aren’t enough to ensure the future of a species that can range widely over catchments. Not only do we need the intensive effort of our project at Pelorus Bridge, but the combined efforts of ongoing and increased research and support by science, and adequate funding to the DOC so they can continue pest control on a landscape scale. And next November I’ll tip my hat to the bat that launched it all. Debs Martin has contributed 10 entries to our website, so far. View entries by Debs Martin. brilliant highlighting the delight in our bats. I do so hope thye can be preserved, conserved and their populations grown. Even if that means confining some for breeding? They are a beautifula nd delicate creature which I ahve always loved. I’m looking forward to seeing a NZ bat for the first time – short-tailed or long-tailed, I don’t care. It’s very sad to think that there are now few places where you’ll get the chance to see a bat, and it makes the work at Pelorus Bridge terribly important. A huge thank you to Debs and Brian and Julie McLintock and the other Nelson and Marlborough Forest & Bird volunteers. Marina, you’ll have to come up to Auckland and join one of the KCC bat-viewing night trips various branches have run up here (eg to Whatipu). I think both types of bat can also be seen quite readily at places like Tongariro, if you know where to look too. Of course, they’re North Island bats; the ones in the Nelson project are South Island ones and critically endangered. The North Island ones are genetically different and are more common/there’s more of them. So if it’s a bat you want to see regardless of it’s genetics, you’ll probably be luckier searching in the North. forests of Urewera and Ruapehu. East Cape, and those in the South Island. I would love to be involved in this amazing project but unfortunatly being on the West Coast it doesn’t seem that there is anything I can do but cheer you guys on! Please let us know if there is anything we can do nationally to help boost and preserve our amazing bats. Just read that Meridian’s latest hydro-dam will threaten these precious bats. I hope you people at Forest & Bird can stop this going ahead! Hi Colleen, if you would like to be involved in a bat network, let me know at d.martin@forestandbird.org.nz and I will add your name. The latest dam to threaten bats Jane, is not by Meridian, but by NZ Energy Ltd. We are doing our best to get a good outcome, but it has been very difficult in this current climate. Thanks all for your support on bats – please look for where you can help out, support, or raise the profile locally. I have also seen bats in flight twice while working on Stewart Island. We really need to help these wee guys out, and try and reverse the loss of bat habitat. In March KCC and Forest & Bird went out to Ball’s Clearing, Hawke’s Bay, and saw long tailed bats flitting around the tree tops. while i stayed at the doc house late last year we watched the bats feeding just on dusk,both long and short tailed we were told.you could see them on the skyline above the hill.it was an awesome experience i will never forget..